Stronghold Red for dogs prevents heartworms, fleas and other harmful parasites. Make sure you have a happy healthy companion, and treat your panting pup with Stronghold Medium Dog Red 12. Stronghold doesn't cover ticks. We recommend you use a tick collar (Seresto, Kiltix etc) or Nexgard, Frotline with Stronghold if you have tick issues on your area. Is stronghold your house brand ? And as good as revolution ? Stronghold is basically the same product from the same manufacturer branded fot different markets. It is identical. Stronghold doesn't protect from ticks. It covers fleas, intestinal worms and heartworm. How young can you use this on puppies?? You can use this products on dogs over 6 weeks old. This product contains 120 mg. Selamectin in each tube. I have been purchasing Stronghold/Revolution for my dog from PetBucket for about 5 years. My dog has never had a flea on him. The medicine is supposed to prevent heartworms too, so to be sure it is working I had him tested for heartworms at his annual check-up and he is negative. So, this medicine is real/it works. I'm in the US and I receive it in about 14 days. I am so happy that PetBucket is in business because I save a lot of money and my dog gets good medicine. I also have recommended PetBucket to my friends. Purchased Stronghold for my multiple cats. Stronghold is inclusive in controlling fleas but other preventive control infestations such as heart worm, biting lice & ear mites. It comes on time; and Petbucket reminds me in advance of pending shipments. Price is the best!!! Great product, great price! Auto delivery is so convenient. Can I use Stronghold for pregnant female? 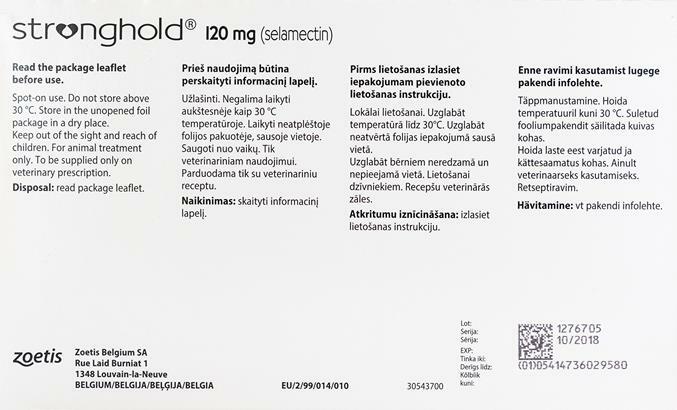 - STRONGHOLD can be used in breeding, pregnant and lactating cats and dogs.